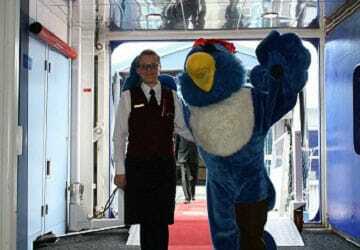 Pearl Seaways features the finest onboard facilities and some much loved onboard entertainment. With room for 2,168 guests this cruise ferry offers an abundance of facilities including a wide range of restaurants, shops and bars. 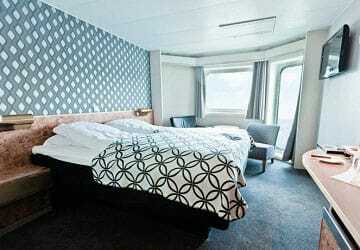 On the Pearl Seaways there's a wide variety of cabin options available, from top of the range Commodore Deluxe to inexpensive standard cabins, with something to suit all budgets. 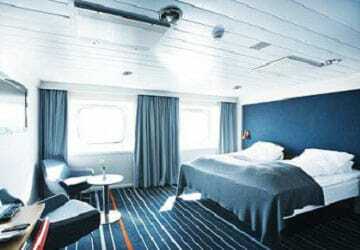 All cabins feature comfortable beds, en suite shower with toilet, bedding, towels and wardrobe space. Onboard there’s a range of restaurants to choose from an all you can eat buffet to a tasty steakhouse - the choice is yours. Whether you are looking for a light snack or a simple coffee, you can find both of these in the cafés onboard. Enjoy your favourite tipple in one of the bars. Whether it's a glass of whisky, shot of tequila or a glass wine, it’s all on offer. Shop tax free onboard the Pearl Seaways. From confectionary to designer clothes there is a wide range of products just waiting to be snapped up. 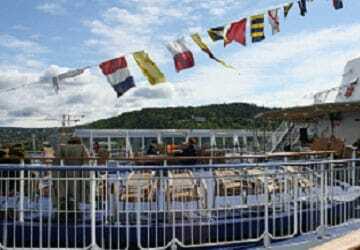 Pearl Seaways features numerous live bands and various onboard entertainment as your sail overnight between Copenhagen and Oslo. Children are well catered for onboard. Visit the ‘Kidz’ Club and let the professional children's entertainers keep the younger passengers entertained during the trip. Elevators provide full access to all areas of the Pearl Seaways and wheel chair accessible cabins can be pre-booked. There is a however a step to the elevator when getting on & off the ship which will require assistance. Please Note: Whilst we have taken great care in making our Pearl Seaways guide as accurate as possible, onboard facilities, services and entertainment may vary depending on the date and time of year that you travel, facilities mentioned may change without notification and ferry companies reserve the right to operate vessels other than those mentioned at time of booking without prior notification. DURING THE PROCESS OF BOOKING ON LINE, IT WASN'T CLEAR FOR ME THE FEATURES OF THE CABIN AND I WOULDN'T BE ABLE TO MAKE A BETTER CHOICE. I TRAVELED WITH MY HUSBAND AND WE GOT A TOO SMALL CABIN WITH TWO BUNK BEDS STACKED ONE OVER THE OTHER. IT WAS TOO UNCOMFORTABLE. "Best way to travel between oslo and copenhagen"
Excellent experience. Good value for money. Best way to travel between Copenhagen and oslo! 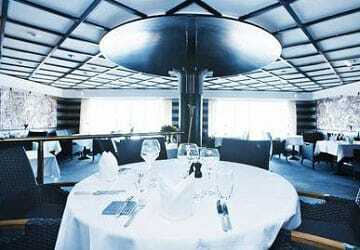 Buffet dinner was delicious I'm surprised they call it a ferry as it was so beautiful it was more like a cruise ship. A great way to travel from Oslo to Copenhagen. 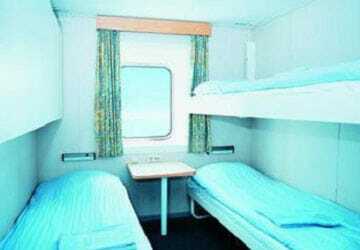 Lots of room to move around, comfortable sleeping cabins. "Copenhagen to Oslo by ferry." We had bunk beds in a small cabin. We slept well, had a hot shower, with good pressure all in a clean cabin. The staff were excellent and although busy seemed cheerful. All that we wanted aboard the ferry. "Perfect way to get to Oslo"
Going by overnight ferry from Copenhagen to Oslo was the best way to travel. Staff were great and the commodore class was ideal. "Very Cozy and Nice Trip"
I love the Pearl. For one thing you would never had such an experience to stand on the rear deck in the deep darkness of a scandinavian snowstorm. It's like a sort of experience in a movie. The harsh and powerful blizard would swallow you and throw you into the waves of abysmal sea behind the ship! But you know it would be impossible when you got back to the warm and quiet cabin. 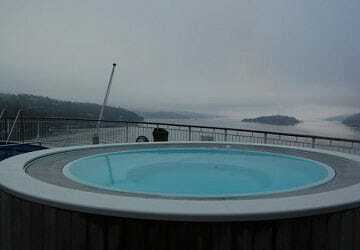 "The trip was very good technically and from the ferry price very reasonable. 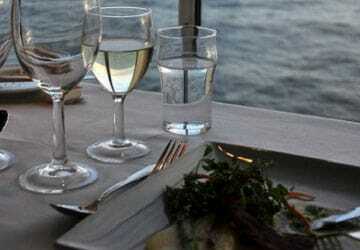 Extent it is fun and it is beneficial for a family to travel to Copenhagen by ferry. CRITICAL remarks: 1 Our family got a cabin in close proximity / on the dance bar. It was possible to sleep because of the noise after two clock at night. 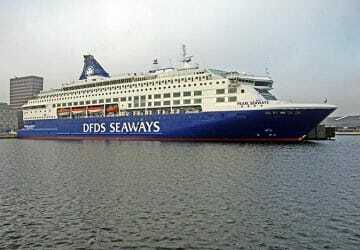 I suggest direct ferries and DFDS Seaways still urgently to give when booking the cabins references to "" restless cabins "" or for FAMILIES primarily the cabins in a quieter location (not over night bar or dance halls) offer. 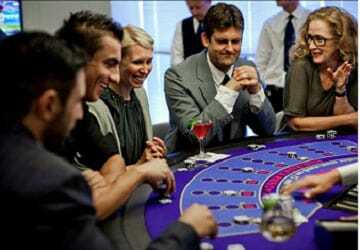 The cabin-position over noisy places should be offered rather young or celebrating guests. It would not be bad if the staff from time to time at night makes a control transition to "celebrating", "guest to ask in the cabins" to rest. 2 The buffet restaurant is quite good, but the reduced "" Children's prices "in" restaurant should also look for 16 - or 17-year-olds are. " I used this trip as a quick means to visit Oslo for a day while I was in Denmark. When I booked the trip I assumed that since this is not a typical cruise but rather a ferry that when the announcements were made that everyone had to to leave the boat in the morning and that it would depart for whatever reason that we had to completely vacate our room. The one thing I wish I had known ahead of time is that since we were taking the evening ferry back that night, and were assigned the same cabin that we could have left our luggage in the room which would have allowed us to pack more appropriately rather than planning to depart with everything we took on board. Other than the very expensive but typical Scandinavian prices for food and drink, everything was good. Staff was friendly and courteous. Parking is directly across the street from the terminal in Copenhagen and taxis readily available outside for quick trips into the city. The journey went well. The crossing was on time, our cabin met our expectations. Food was expensibe. 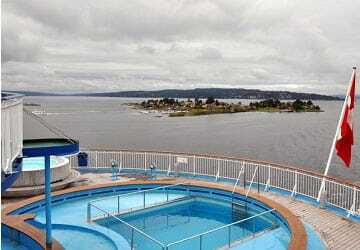 The ferries are very comfortable and the service aboard is very pleasant. The loading and unloading of cars is appalling. Under crew control my car had paintwork damaged as I was directed to go too close to the wall on the outward trip. On the return voyage we were instructed to stay in the car until finally in position, at which point the only way for myself and one passenger to get out of the car was by climbing over to the other door as we were against the wall on deck 4. 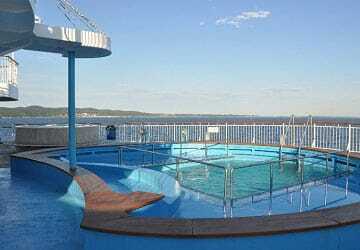 No lift was available until we climbed to deck 6 which was not easy for my passengers, all pensioners with ability problems. I spoke with the loading officer who blamed the dock company and said he had this problem regularly, but could not persuade the people concerned to help. It was one of the best trips in ferry that I have been to thanks to the landscape, quietness, organization and punctuality. Recommendable to all effects. The 17 hours of journey seem shorter in this ship. Oslo to Copenhagen by DFDS ferry definitely beats flying as a way of getting from Norway to Denmark. The journey was smooth, comfortable, hassle-free and thoroughly enjoyable. Time out to appreciate the scenery and take things easy. 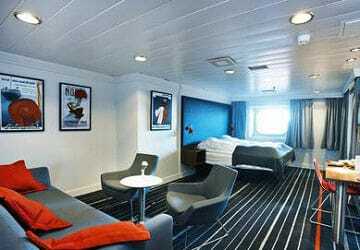 The ship was spotlessly clean and all the staff we dealt with were courteous, friendly and efficient. Dinner in the Steakhouse and breakfast in the main downstairs cafe were excellent and, after a week in Norway, the prices on this Danish boat were a distinct relief. We would recommend this service to anyone, and are already contemplating repeating the journey in the opposite direction next year. 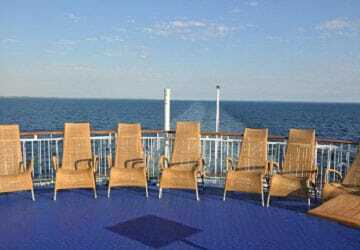 The journey from Oslo - Copenhagen is comfortable because it travels at night, offers ample entertainment and the following morning you arrive in Copenhagen without having the feeling of lost time. Check-in (3 people and 1 car) proceeds smoothly and professional and you are handed the cabin's key card there and then. Our joy of having a cabin bordering the rear deck (lovely, easy to romantically draw in some air) turned to irritation in the evening. Our cabin was right over the night club. We didn't have to go to this club because we were dancing in our beds! By midnigh my wife could not take it any longer and she went and complained. She was given a different cabin where she slept by herself since her husband couldn't not move because our child was fast asleep (luckily). In short, a terrible night and a headache in the morning. Piece of advice, make sure you book a cabin far away from the music! A beautiful sunny day, very quick check-in and boarding, staff very kind and helpful. On the arrival, like on the plane, they were all in line to thank passengers. On time and quick during disembark operations. Except for the sun, nothing like Italy! If you're travelling through Scandinavia, i would highly recommend the journey from Copenhagen to Oslo by boat. Loads to do and staff courteous and polite. Thanks DFDS. "A beautiful excursion. Highly recommended. " From booking to the end of the trip everything worked out very well. The staff were very polite and helpful. We enjoyed the voyage very much. The only thing that could be improved would perhaps be information on where the ship is just what the coasts can be seen. Such a thing as there are in the buses " Hop on Hop Off " for sightseeing.